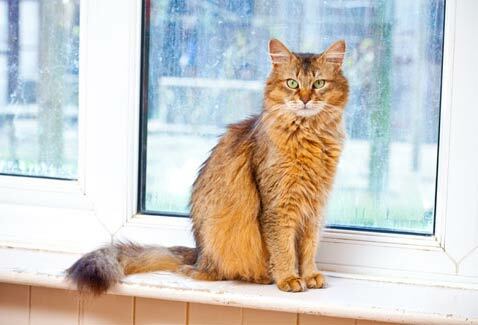 Somali cat breed information and advice. Somali cats are like miniature lions and bring a permanent smile in your life. Sometimes referred to as an Abyssinian cat in an overcoat and a 'little lion' due to the charming ruff around their necks, the Somali is a breed like no other. Emma Watts, chairman of the Somali Cat Club, is full of enthusiasm for this bountiful breed with its playful personality and beautifully patterned coat. She says: "Although I really love the look of a Somali, I think the best reason for choosing one as a pet is for their wonderful personality! I adore their completely innocent look when they have been naughty, the warm smile as they settle onto your lap with a contented chirrup, but most of all, the way they love to be with you all the time and share everything you do. "A Somali will walk straight into the bathroom when you are in the bath, or they'll arrive in the kitchen to 'help' with the cooking or, best of all, on a cold winter's night they are always ready to share their luxurious warmth as they snuggle up under the duvet. A Somali is a very special cat!" Described by many breeders as being almost dog-like, Somalis love human company and become very attached to their owners. They need lots of affection and attention; they will want to be with you constantly and will, in return, reward you with their love and loyalty. Somalis are a medium-sized breed with a semi-longhaired, very soft, fine coat. They come in a wide range of colours with ticked coats (alternate bands of base and ticking colours along each hair). The most popular is the 'usual' Somali which has an apricot and black coat with black ear tips and tufts, while sorrels are a bright coppery colour and fawns have warm and powdery tones. There are also blues, silvers, lilacs, chocolates and reds. The Somalis' mouth has slightly upturned corners which gives them the appearance of having a constant smile. A low maintenance breed, all they need to keep them looking their fluffy best is a good brushing every week. Most sources agree that the first official Somali was born in the early 1960s in America by Abyssinian breeders Evelyn Mague and Charlotte Lohymeyer. One of their kittens George, was a longhair, who Charlotte gave away. A year later Evelyn found him again by chance as a fully-grown longhaired Abyssinian. When Charlotte retired, Evelyn acquired both of George's parents and was determined to produce more longhaired Abyssinians, which eventually started coming through, and they were given the name Somali. Evelyn founded the Somali Cat Club of America in 1972 and Somali cats were imported to the UK in 1980. They achieved Governing Council of the Cat Fancy (GCCF) Championship status in 1998. Generally, kittens should look healthy, strong and be quick to learn. As with all breeds, look for a lively-looking kitten and breeders should be able to show you proof of testing for diseases such as Pyruvate kinase deficiency (PkDef), which is an inherited disease of Abyssinian and Somali cats. Expect to pay around £400 for a pet kitten, but prices vary according to location. The ticking on Somali kittens can be slow to develop but by the time they are 14 weeks old and ready to go to their new homes, the ticking should be apparent at least across the shoulders. The dilute colours, such as the fawn, will take more time to achieve clear definition. Generally, Somalis are a healthy, robust breed. However a genetic disease called Progressive retinal atrophy (PRA), which damages the retina and causes progressive blindness, was present in the breed for a time. The Somali Breed Advisory Committee is reassuring breeders and owners there have been no recorded instances of Somalis in the UK affected with blindness caused by PRA, and they recommend breeders make the most of genetic screening or testing where possible to ensure their cats are clear. Somalis also now come in a shorthair variety, making it very similar to its origins in the Abyssinian cat breed. Shorthair Somalis have been in existence since day one, as some Abyssinians carried the longhair gene. Shorthairs known to carry the longhair gene were called Somali variants, which could be bred from but not shown in competition. The Somali Cat Club applied for the variants to be renamed Somali Shorthair and sought permission for them to be shown, and in February 2012 the GCCF granted preliminary recognition. The differences are subtle between the Shorthair Somali and Abyssinian, but you can notice the difference in head shape and contours. See how the coat on the Abyssinian is shorter and closer? The Shorthaired Somali has a medium-length coat that is smooth, fine and dense but close-lying with no ruff, toe tufts or brush, while the Abyssinian coat is far more resilient.